Tropical homegardens are characterized by the deliberate management of trees in intimate association with annual and perennial agricultural crops and small livestock within house compounds. The whole tree - crop - animal unit is intensively managed by family labor. Known by a variety of names, these agroforestry systems are commonly found throughout the tropics and especially in areas with high population densities (Table 1) - [Fernandes and Nair, 1986]. 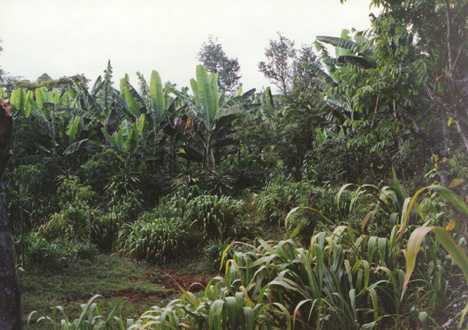 Chagga Homegardens-The tree gardens of the Chagga The tree gardens of the Chagga people of Mount Kilimanjaro provide an inspiring model of how land can be sustainably managed.